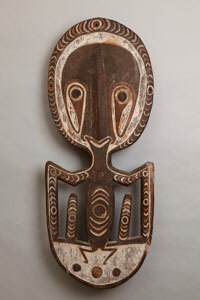 The University of Wyoming Art Museum recently acquired a gift from the Salgo Trust for Education that will be featured in the museum's coming exhibition, "Journeys along the Sepik River: Tribal Art from Papua New Guinea," that opens March 31. Admission is free. Nicolas M. Salgo, the late Hungarian-American financier and diplomat, amassed an eclectic collection of art and formed the Salgo Trust for Education. The extensive Salgo collection is located in a trust, in an art history research center in Port Washington, N.Y. While on a trip to New Guinea in the early 1970s with famed architect I.M. Pei, Salgo collected these objects. Made of carved and painted wood, they are based on traditional art from the rivers, but were made long after the art of those areas was influence by the West. These objects are considered the best and most creative work from Papua New Guinea and are held in high regard by collectors and museums such as the Metropolitan Museum in New York, says Susan Moldenhauer, the art museum's director and chief curator. "The addition of the Salgo collection offers a number of affinities with the museum's existing collection," Moldenhauer says. "These new linkages offer opportunities for research to students and scholars at UW and other institutions." For additional information about the UW Art Museum, call (307) 766-6622 or visit the museum's webpage at www.uwyo.edu/artmuseum or at www.uwartmuseum.blogspot.com.